Sunflower League rivals Olathe North and Olathe South will meet on the gridiron after a 1-year absence. The Eagles and Falcons didn’t play each other in 2017, and both have started the season by winning three of their first four games. Perhaps no team is more eager to get back on the field than Olathe North. The Eagles made the long journey to suburban Denver last week to take on Colorado’s No. 3-ranked Columbine High. The host Rebels raced out to a 28-0 halftime lead en route to a 48-12 win. Olathe North garnered very little momentum, but opened the third quarter with a Daymonn Sanchez touchdown run to pull within 28-6. After the Eagle defense forced a three-and-out, Devin Stoker returned the Columbine punt deep into Rebel territory, but the return was negated by a penalty. Any momentum on the Eagles side was quickly thwarted by a turnover shortly after. Against Sunflower League competition, Olathe North has rolled to three wins while averaging nearly 52 points per game. The Eagle offense keeps things on the ground nearly 77 percent of the time in averaging nearly 300 yards per game. Olathe North is led by the backfield tandem of Sanchez and quarterback Arland Bruce, IV. Sanchez has rushed for 578 yards and 10 touchdowns already this season, while Bruce has added more than 400 yards and seven scores. Bruce has added 405 passing yards and four scores. Olathe South has had success with an offense featuring several young players. The Falcons posted wins over Lawrence and Olathe Northwest before an overtime loss to Shawnee Mission Northwest. In the loss to the Cougars, starting quarterback Evan Foster went down with an injury. Sophomore Reed Smith stepped in and passed for 250 yards. In last week’s 54-24 win over Shawnee Mission South, Smith passed for 157 yards and a touchdown. Sophomore Andrew Nehrbass rushed for 209 yards and four scores in the victory and is nearing 500 yards rushing on the season. Whoever has played quarterback has benefitted from big receiving target A.J. Shields. Shields (6-4, 180) has 28 catches for 520 yards and six touchdowns already this season. Olathe North has dominated the series of late – winning five straight and nine of the last ten meetings. Olathe South’s last victory over North came during the 2011 season when the Falcons captured the Class 6A state title. Two of the state’s top defenses have their first matchup between the teams since 2013. The Maize Eagles hold a 6-2 margin over Goddard since ’06. Maize has not permitted a point this year and has averaged 41 points a contest. Maize and Class 3A Scott City are the only teams in Kansas to not allow a point. The Eagles have defeated Valley Center and Hutchinson by 49-0 scores and then earned a key road 21-0 victory versus Campus. Last week, Maize beat Newton, 45-0. Quarterback Caleb Grill, a South Dakota State basketball signee, has had an excellent first month. Last week, he passed for more than 150 yards, and Preven Christon returned a punt return for a score. Against Campus, Camden Cox delivered a rushing touchdown, Camden Jurgensen had a 95-yard kickoff return and Grill tossed a touchdown pass. Last year, Maize was 9-2 and permitted just 17.7 points a contest. Goddard was 11-1 and allowed just 13.7 per game, best in 5A. Goddard, under first-year coach Tom Beason, a former assistant, has averaged 24 points a contest. The Lions have allowed just 27 points and rank third in 4A in scoring defense after they moved down a classification. Sophomore Kyler Semrad has completed 53 of 106 passes for 671 yards with a 5/5 TD/INT ratio. Goddard has averaged 120 rushing yards a game with 3.5 yards per rush. Junior Blake Mitchell leads with 21 catches for 285 yards and two scores. While Goddard has committed eight turnovers, its significant strength comes in turnover creation. The Lions have forced 14 turnovers and recovered nine fumbles – incredibly one by nine different players. Junior Zeke Howell has eight sacks for 51 lost yards, and senior Trenton Willert has tallied 10 TFLs. Goddard beat Andover Central, 17-16 in overtime in Week 3, and then knocked off rival Eisenhower, 12-3, last week. While both teams have elite defenses, Maize has a strong edge offensively, especially at quarterback. This matchup will have significant ramifications for the Wichita City League and Class 5A. Northwest has not won the City League outright since 2015, its only outright league title since 2005. Kapaun has not won an outright City League crown since a 6-0 mark in 1982, according to Kansas Football History. Wichita Northwest and Kapaun join Maize, DeSoto and Aquinas as the lone undefeated teams left in Class 5A. Northwest, long known for its high-octane offense, leads 5A in scoring at 191 points. The Grizzlies have permitted 88, for an average score of 48-22, very close to last year’s pace of 50-22 that yielded a state semifinal berth. Kapaun finished 6-4 last season and delivered a strong defense that permitted just 19.6 points per contest, seventh-best in 5A. However, Kapaun held opponents an average of 10 points lower compared to their season average in games when opponents did not play the Crusaders. Last year, Kapaun lost Northwest, 26-14, the fewest points the Grizzlies scored since a first-round playoff contest in 2014. This season, Kapaun has again posted an exceptional defense. While the Crusaders have tallied just 96 points, easily the fewest among the 4-0 squads, they have allowed just 29 points, third-best in the classification. The Crusaders were especially stingy in the first two weeks with just 26 total yards permitted. Kapaun’s schedule is backloaded with Andover, Northwest, Carroll, St. James and Heights. Last week, the Crusaders delivered a quality win with a 33-26 win at Andover. Kapaun has played two quarterbacks, who have combined for 31 of 67 passing for 437 yards with a 4/1 TD/INT ratio. Scott Valentas, a Columbia University commit, leads the team with 77 carries for 371 yards and has seven of the team’s nine rushing TDs. Kapaun has averaged 3.4 yards per carry and 6.5 yards per pass. Northwest junior quarterback Reagan Jones, an Andover Central transfer, has stepped in well with 44 of 73 passing for 771 yards with a 10/2 TD/INT ratio. NW has averaged 10.6 yards per pass and 5.9 yards per rush. Senior Breece Hall, an Iowa State commit, has again delivered an exceptional season with 545 rushing yards and six scores. Overall, he has 783 all-purpose yards and 10 TDs. Senior Marcus Hicks, an Oklahoma commit, leads the team with 37 tackles, 14.5 tackles for loss and six sacks. 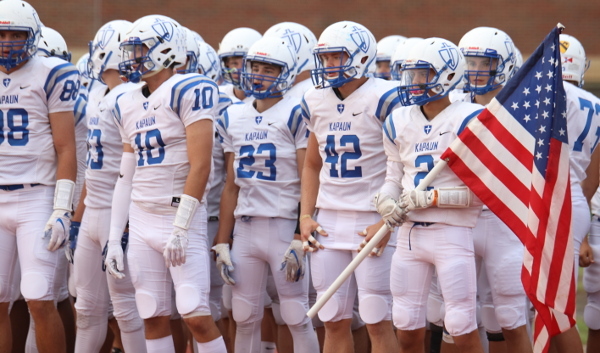 Kapaun is 2-12 in the last 14 meetings against Northwest and has lost four in a row, though the games are competitive with defeats by 17, 16, 21 and 12 points. This year will likely yield more of the same, as Kapaun has the ability to slow down Northwest but can’t match the Grizzlies’ overall talent. Galena will travel to Caney Valley in another important game in Class 3A, District 1. The game also pits the top two teams from the neighboring CNC and Tri-Valley Leagues. Galena is knocking on the door of a top-5 ranking after a dominating 4-0 start that has seen the Bulldogs outscore opponents by a total margin of 185 to 30. Last week, Galena travel to league-rival Frontenac and dominated the 2017 4A-II runners-up, 47-0. Joseph Helton rushed for three touchdowns in the first half, JC Shelton added another as the Bulldogs built a 32-0 halftime lead. With the help of a ball-control offense and an onside kick, Galena held Frontenac to 10 offensive plays in the first half. The veteran backfield of Shelton, Helton, and Kooper Lawson is the key for Galena. They’ll face another run-dominant team this week in Caney Valley. The Bullpups, under veteran coach Criss Davis, have reached the playoffs eight straight seasons. Caney Valley has posted a 69-21 record since 2010. Last season, the Bullpups finished 8-3 and reached the second round of the 3A playoffs. Caney Valley graduated the schools’ career rushing leader in Grant Richey, but Trey Richey has taken over as the feature back from his quarterback position and led the Bullpups to dominating wins over TVL opponents in Cherryvale, Eureka, and Neodesha. Last week, Caney opened district play with a 24-6 road win at Columbus. Trey Richey rushed for 162 yards and two scores on only seven carries. Ben Nunnelly moved from fullback to running back after an injury to Cole Ellis, but the Bullpups have other options in Matthew Simpson and Cam Melchiori. The Bullpup defense will have to be good against the run as they were last week in holding Columbus to 49 yards on 30 attempts. There are only three teams in the Twin Valley League that play 11-man football. Troy will travel to Centralia on Friday to help decide the 11-Man TVL title. Troy has already defeated the third member, Valley Heights, to open this season. Centralia will play the Mustangs to close out the regular season. After completing a 13-0 season the culminated in the 2016 2-1A state title, the Troy Trojans were hit heavily by graduation and fell back to 4-5 with a young team last season. That meant a bulk of returning starters would be back for coach Derek Jasper this season. The Trojans opened with a solid 27-12 victory over Valley Heights and followed with road wins over Pleasant Ridge (18-0) and Horton (41-8). Last week, Troy dropped a 20-19 decision to Christ Prep Academy in a game where the Trojans scored late but could not overtake the Patriots. Junior Kipp Jasper guides the offense from behind center after throwing for more than 1,350 yards as a sophomore a season ago. Reid Jasper is his primary target at receiver. Reed had nearly 600 yards receiving last season, and has 261 yards and four scores through four games. Troy will face a tough test Friday in the Centralia Panthers. Centralia, ranked No. 2 in Class 1A to begin the season, dropped its first two games to 2A contenders Rossville (26-14) and Riley County (26-21). The Panthers then rebounded with a blowout victory over St. Marys before shutting out St. Mary’s Colgan last week. In the win over Colgan, Isaac Gore rushed for 235 yards and a touchdown, while Kamble Haverkamp added two touchdowns. Centralia’s defense was dominant in holding Colgan to 68 yards of total offense. But the Centralia offense had just as much to do with that in controlling possession and limiting Colgan to just 21 offensive plays in the game. While this isn’t a district game, it still a key game in trying to determine the pecking order in what is turning out to be a crowded group of contenders on the east side of 1A. A significant matchup in Eight-Man, Division I, District 7 that will likely decide the top-two spots as Victoria makes the 148-mile trip northeast to take on Clifton-Clyde. This is believed to be the first game between the schools, according to Kansas Football History archives. Both teams have experienced coaches with more than 100 career wins at their respective schools with Victoria’s Doug Oberle and Clifton-Clyde’s Russ Steinbrock and plenty of skill position depth. Victoria has outscored teams, 158-70, with a quality Week 1 home win versus Otis-Bison, a top-5 Division II squad. Clifton-Clyde delivered a strong 64-14 victory at Hill City last week in district play. Clifton-Clyde has outscored teams, 234-34, and is tied for second in Division I for scoring offense. The Eagles returned virtually its entire team, especially at the skill positions, from a playoff squad last year. Clifton-Clyde has rushed for 308 yards a game with 27 in the passing game. Senior Drake Steinbrock has 25 carries for 426 yards and seven scores. Sophomore Aiden Rudolph has 25 carries for 322 yards and six scores. Senior Christian Seifert has 27 carries for 274 yards and nine TDs. The Eagles have averaged 11.4 yards per carry and 4.7 yards per pass. Standout senior Nathan Ohlde returned last week and delivered six tackles with a tackle for loss and a sack. Steinbrock has 40 tackles with five sacks to lead the team. Victoria has averaged 5.8 yards per play with a Week 2 loss at undefeated Central Plains. Senior Cooper Windholz has completed 18 of 33 passes for 265 yards with eight scores. He has 31 rushes for 148 yards and four TDs. Tyler Knoles has 29 carries for 181 yards and three TDs, while Jayvon Pruitt has 50 rushes for 285 yards and four scores. End Caden Oberle and lineman Kirk Huser have been those who have played well. Victoria has had a big home/road split since Week 9 of the 2016 season. Since then, the Knights are 8-0 at home and 3-4 on the road. Last year, the Knights were 5-0 at home and lost three close road games to Otis-Bison, Osborne, and Burlingame by a combined 18 points. This year, Victoria fell, 32-8, at Central Plains and defeated Otis-Bison at home. While the Knights do have quality road wins against Central Plains and Solomon in 2017, the home field advantage might be enough to swing a close matchup.